So you know about that Vanity Fair piece on Mia Farrow a few months ago. And Ronan Farrow's subsequent tweets during the Golden Globes about honouring Woody Allen. And then a week ago, an article was posted at The Daily Beast, written by Robert B Weide who shot a PBS documentary about Allen's work. Weide begins with a defence of Allen's relationship with Soon-Yi Previn and then goes on to deconstruct the abuse allegations. While some might see that some of his points may have been salient, even factual, the tone of the piece is ...aggressive, borderline gross. Click here to read the full article at The Daily Beast. The point? To make you doubt Mia Farrow's claims. To make you question whether or not Dylan Farrow, who was alleged molested by Woody Allen, is telling the truth. And to give people in Hollywood something to cling to as justification for continuing to work with Woody Allen. Because "we just can't know what happened". So Dylan Farrow decided to tell us exactly what happened. This weekend. Via The New York Times. In my opinion, her revelation is a direct response to that piece in The Daily Beast. Which wasn't actually as widely read as you might think, certainly not by those who don't live on the internet, and certainly not as widely read as Dylan Farrow's follow-up. Everyone now knows about Farrow's follow-up. About how Woody Allen allegedly led her up to the attic. About how he allegedly touched her. About how it scarred her. She defended herself. She defended her mother. And she challenged those who would defend Woody Allen by representing his art. “What if it had been your child, Cate Blanchett? Louis CK? Alec Baldwin? What if it had been you, Emma Stone? Or you, Scarlett Johansson? You knew me when I was a little girl, Diane Keaton. Have you forgotten me? Click here to read Dylan Farrow’s open letter. Allen will release a response to these allegations soon. In the meantime, through his publicist, he calls Dylan’s claims “untrue and disgraceful”, reiterating that “a thorough investigation was conducted by court-appointed independent experts (at the time and) the experts concluded there was no credible evidence of molestation; that Dylan Farrow had an inability to distinguish between fantasy and reality; and that Dylan Farrow had likely been coached by her mother Mia Farrow”. His lawyer adds, “It is tragic that after 20 years a story engineered by a vengeful lover resurfaces after it was fully vetted and rejected by independent authorities. The one to blame for Dylan's distress is neither Dylan nor Woody Allen”. Dylan Farrow is now 28 years old. She’s telling her story for the first time. For the first time she’s confronting some of our favourite celebrities with her story. In addition to the people she called out, that includes Ewan McGregor, Colin Farrell, Penelope Cruz, Javier Bardem, Patricia Clarkson, Larry David, Naomi Watts, Anthony Hopkins, Freida Pinto, Rachel McAdams, Michael Sheen, Marion Cotillard, Tom Hiddleston, Ellen Page, Jesse Eisenberg...and most recently…Emma Stone and Colin Firth. Don’t tell me there’s not a name on that list that doesn’t mean something to you. Up to this point, all of them have been able to justify their artistic decisions by telling themselves that “we don’t really know what happened”. But Dylan Farrow has just told them. So, if you’re the next actor who says yes to a Woody Allen script, because you see that Penelope Cruz won an Oscar after working with him and Cate Blanchett might win an Oscar after working with him, and you decide to work with him, does that mean that you choose to believe him over Dylan? And if that’s the case, is that the choice that they’ve been making over and over and over again in the 20+ years since this sh-t went down? 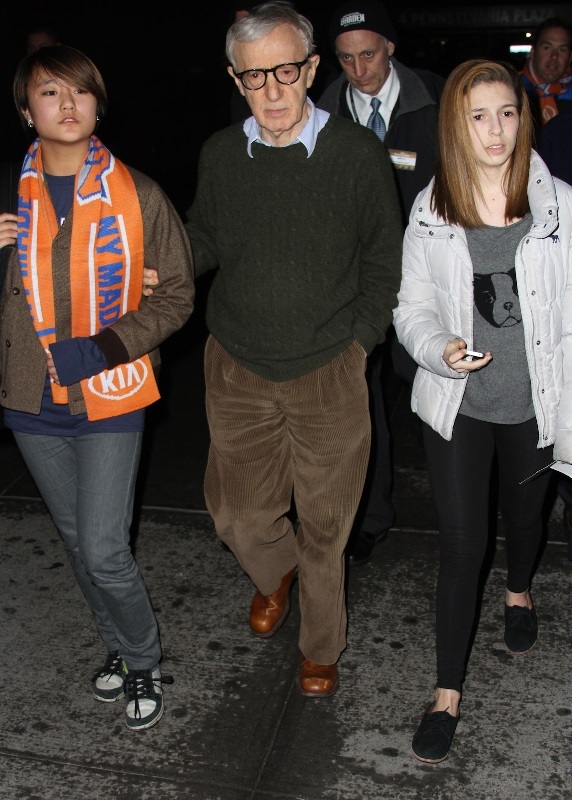 Attached – Woody Allen leaving the Knicks game with his daughters.